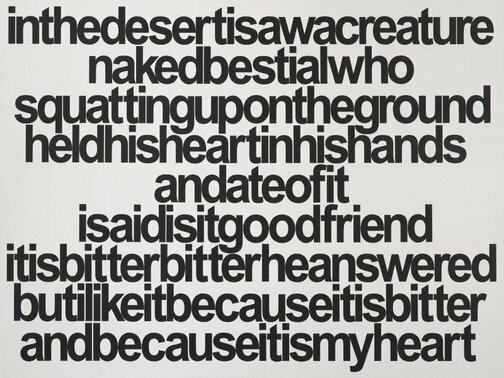 'becauseitisbitter' 2009 by Vernon Ah Kee, features a stanza or 'lines' from a poem by Stephen Crane (1871-1900). Crane was a prolific author and his life experiences of war zones, New York and as an expatriate informed his writing earning him a reputation as an avant-garde and often controversial figure. From the earliest days of his career as an artist, Vernon Ah Kee has similarly used text to explore and expose contemporary and controversial issues, surrounding the construction of race and systems of privilege. As the artist states much of his work evolves out of the "experiences of my mother or my grandmother on Palm Island and growing up poor and hungry and seeing privilege played out in front of me". The use of bold, sans serif text also extrapolates Ah Kee's desire to state his position plainly, in 'black and white', drawing on the slogans and placards of activist politics. 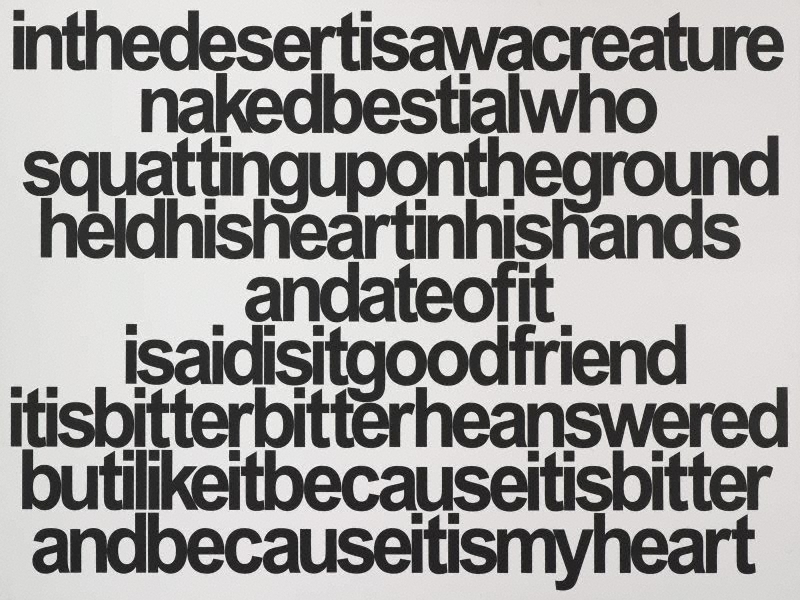 Further, the artist’s technique of running words together compels the viewer to engage with the work actively in deciphering and, often, speaking the message. 'becauseitisbitter' 2009 has additional resonance in the contemporary context of Australian race relations. The reference to the desert could be interpreted as evoking the federal government's controversial Northern Territory Emergency Response or the Intervention, as it is more commonly known. This policy, introduced in 2007 and continuing to the present day, initially required the suspension of the Racial Discrimination Act to effect its measures. Alongside the work of other politically active artists held in the collection, such as Richard Bell's 'Pay the Rent', the work incisively articulates the role of art as a forum for radical agency. See you at the barricades , Sydney, 2015, 30-1 (illus. ), 46.